In 2016, as Sarrah Nomanbhoy was starting her MBA at the Haas School of Business, the refugee crisis in Europe was in its second peak year and over a million applicants applied for asylum to the EU. Nomanbhoy, a native Californian, had been watching the refugee crisis unfold since her undergraduate days at Stanford, where she studied international relations. She understood that the forces behind the crisis were bound to exacerbate the situation and the number of displaced people would only increase. She also began to understand that only 2 percent of refugees have access to voluntary repatriation, resettlement, or local housing solutions; the rest face long-term encampment, urban destitution, or perilous journeys. At UC Berkeley, Nomanbhoy learned from Law Professor Katerina Linos that many asylum seekers arriving in Europe lack adequate information about how to apply for asylum, particularly how to prepare for the arduous asylum interviews. This motivated her and fellow graduate students Jerry Philip (Haas MBA ’18) and Peter Wasserman (Haas MBA 18) to apply for a Hult Prize focused on the refugee crisis. 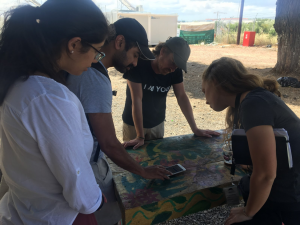 MarHub intern Ramah Awad (left) and Jerry Philip (EWMBA ’19) show MarHub’s prototype to NGO staff in the Ritsona Refugee Camp in Greece. Their idea was to come up with a digital means to inform asylum seekers about what to expect at asylum interviews and to convey a variety of legal rights, including the option to review interview transcripts and replace a translator. According to Nomanbhoy, about 70 percent of asylum seekers receive negative decisions after this first set of interviews, and many are in limbo pending the outcome of the appeal process. 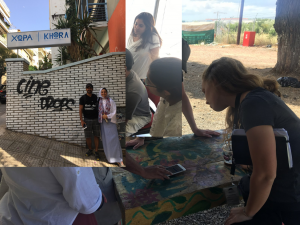 With support from various Berkeley grants, the team traveled to Greece during the summer of 2017 to research the project. They saw firsthand that refugees often seek asylum alone, without much legal advice. Although legal aid organizations were on the ground, they witnessed there were not enough resources to accommodate the many asylum cases. As a result, the refugees often went into the life-defining interview process blind, reducing the chances for a favorable outcome. 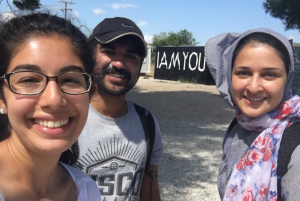 When the three students returned to campus, they began to develop a chatbot, called MarHub (a reference to the Arabic greeting marhaba), which would allow refugees to receive personalized information regarding their specific path to asylum. Among the team’s insights is that a vast majority of Syrian migrants in Europe and the Middle East own smartphones and thus can be serviced remotely, without a large team on the ground. By the fall of 2017, the MarHub team knew they had a strong idea, but they were struggling with their implementation strategy. They turned to the Blum Center’s Big Ideas student innovation contest for mentorship and support. Katy Digovich, who works for the Clinton Health Access Initiative and served as MarHub’s Big Ideas mentor, proved especially beneficial, as she has expertise in implementing technology solutions in resource constrained environments. Feedback from the judges in the first and second rounds of the competition helped Nomanbhoy and her colleagues refine their purpose and think carefully about their approach. Utilizing feedback from the judges in the first and second rounds of the competition allowed the team to refine their purpose and helped them win third place in the Connected Communities category in May 2018. The Marhub team is now preparing to launch a limited pilot in Lebanon early next year. Refugees there will be able to access MarHub on Facebook messenger and receive updated information instantaneously. After refugees answer a few questions, for example, the MarHub tool walks them through what to expect and how to present their case. The information comes directly from legal organizations devoted to the refugee crisis, protecting refugees from misinformation. and provide information about legal rights. 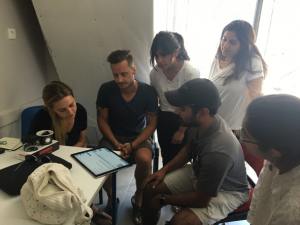 In the long term, the team hopes to connect refugees with a wide range of services, including job placement, health services, and housing.